Not to be confused with the geographical region of Judea. The Roman province of Judea (/dʒuːˈdiːə/; Hebrew: יהודה‎, Standard Yehuda Tiberian Yehûḏāh; Greek: Ἰουδαία Ioudaia; Latin: Iūdaea), sometimes spelled in its original Latin forms of Iudæa or Iudaea to distinguish it from the geographical region of Judea, incorporated the regions of Judea, Samaria and Idumea, and extended over parts of the former regions of the Hasmonean and Herodian kingdoms of Judea. It was named after Herod Archelaus's Tetrarchy of Judea, but the Roman province encompassed a much larger territory. The name "Judea" was derived from the Kingdom of Judah of the 6th century BCE. Before 4 August 70 is referred to as Second Temple Judaism, from which the Tannaim and Early Christianity emerged. 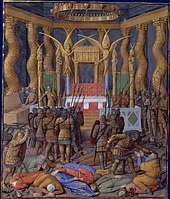 According to the historian Josephus, immediately following the deposition of Herod Archelaus, Judea was turned into a Roman province, during which time the Roman procurator was given authority to punish by execution. The general population also began to be taxed by Rome. The province of Judea was the scene of unrest at its founding in 6 CE during the Census of Quirinius, the Crucifixion of Jesus circa 30-33 CE, and several wars, known as the Jewish–Roman wars, were fought in its history. The Second Temple of Jerusalem was destroyed by the Romans in 70 CE as part of the First Jewish–Roman War, resulting in the institution of the Fiscus Judaicus, and after the Bar Kokhba revolt (132–135), the Roman Emperor Hadrian changed the name of the province to Syria Palaestina and Jerusalem to Aelia Capitolina, which certain scholars conclude was an attempt to remove the relationship of the Jewish people to the region. 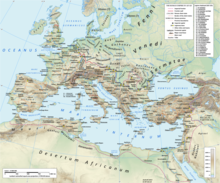 The first intervention of Rome in the region dates from 63 BCE, following the end of the Third Mithridatic War, when Rome made a province of Syria. After the defeat of Mithridates VI of Pontus, Pompey (Pompey the Great) sacked Jerusalem and established Hasmonean prince Hyrcanus II as Ethnarch and High Priest, but he was denied the title of King. A later appointment by Julius Caesar was Antipater the Idumaean, also known as Antipas, as the first Roman Procurator. Herod the Great, Antipater's son, was designated "King of the Jews" by the Roman Senate in 40 BCE but he did not gain military control until 37 BCE. During his reign the last representatives of the Hasmoneans were eliminated, and the great port of Caesarea Maritima was built. He died in 4 BCE, and his kingdom was divided among three of his sons, two of whom (Philip and Herod Antipas) becoming tetrarchs ("rulers of a quarter part"), and one of whom (Archelaus) becoming an ethnarch who ruled over half of his father's kingdom. One of these principalities was Judea, corresponding to the territory of the historic Judea, plus Samaria and Idumea. Herod's son Archelaus ruled Judea so badly that he was dismissed in 6 CE by the Roman emperor Augustus, after an appeal from his own population. Herod Antipas, ruled as tetrarch of Galilee and Perea from 4 BCE to 39 CE, being then dismissed by Caligula. Herod's son, Philip the Tetrarch, ruled over the northeastern part of his father's kingdom. The Roman empire in the time of Hadrian (ruled 117–138 CE), showing, in western Asia, the Roman province of Judea. 1 legion deployed in 125. In 6 CE Archelaus' tetrachy (Judea, plus Samaria and Idumea) came under direct Roman administration. The Judean province did not initially include Galilee, Gaulanitis (the Golan), nor Peraea or the Decapolis. Its revenue was of little importance to the Roman treasury, but it controlled the land and coastal sea routes to the bread basket of Egypt and was a buffer against the Parthian Empire. The capital was at Caesarea Maritima, not Jerusalem. Quirinius became Legate (Governor) of Syria and conducted the first Roman tax census of Syria and Judea, which was opposed by the Zealots. Judea was not a senatorial province, nor an imperial province, but instead was a "satellite of Syria" governed by a prefect who was a knight of the equestrian order (as was Roman Egypt), not a former consul or praetor of senatorial rank. Still, Jews living in the province maintained some form of independence and could judge offenders by their own laws, including capital offenses, until c. 28 CE. The Province of Judea during the late Hellenistic period and early Roman period was also divided into five conclaves, or administrative districts: Jerusalem (ירושלים), Gadara (גדרה), Amathus (עמתו), Jericho (יריחו), and Sepphoris (ציפורין). The 'Crisis under Caligula' (37–41) has been proposed as the first open break between Rome and the Jews. Between 41 and 44 CE, Judea regained its nominal autonomy, when Herod Agrippa was made King of the Jews by the emperor Claudius, thus in a sense restoring the Herodian dynasty, although there is no indication Judea ceased to be a Roman province simply because it no longer had a prefect. Claudius had decided to allow, across the empire, procurators, who had been personal agents to the Emperor often serving as provincial tax and finance ministers, to be elevated to governing magistrates with full state authority to keep the peace. He elevated Judea's procurator whom he trusted to imperial governing status because the imperial legate of Syria was not sympathetic to the Judeans. Following Agrippa's death in 44 CE, the province returned to direct Roman control, incorporating Agrippa's personal territories of Galilee and Peraea, under a row of procurators. Nevertheless, Agrippa's son, Agrippa II was designated King of the Jews in 48. He was the seventh and last of the Herodians. From 70 CE until 135 CE, Judea's rebelliousness required a governing Roman legate capable of commanding legions. Because Agrippa II maintained loyalty to the Empire, the Kingdom was retained until he died, either in 93/94 or 100, when the area returned to complete, undivided Roman Empire control. 66–70 CE – First Jewish–Roman War, resulting in the siege of Jerusalem the destruction of Herod's Temple and ending with the siege of Masada in 73–74. (see Josephus). Before the war Judaea was a Roman province of the third category, that is, under the administration of a procurator of equestrian rank and under the overall control of the governor of Syria. After the war it became an independent Roman province with the official name of Judaea and under the administration of a governor of praetorian rank, and was therefore moved up into the second category (it was only later, in about 120 CE, that Judaea became a consular province, that is, with a governor of consular rank). 115–117 CE – the Kitos War; Judea's role in it is disputed though, as it played itself out mainly in the Jewish diaspora and there are no fully trustworthy sources on Judea's participation in the rebellion, nor is there any archaeological way of distinguishing destruction levels of 117 CE from those of the major Bar Kokhba revolt of just a decade and a half later. 132–135 CE – Bar Kokhba's revolt; Following the suppression of Bar Kokhba's revolt, the emperor Hadrian changed the name of the province to Syria Palaestina and Jerusalem became Aelia Capitolina which Hayim Hillel Ben-Sasson states was done to erase the historical ties of the Jewish people to the region. However, this did not prevent the Jewish people from referring to the country in their writings as either "Yehudah" (Hebrew: יהודה) or "The Land of Israel" (Hebrew: ארץ ישראל). Palaestina Tertia (the Negev desert, with Petra as capital). ^ Josephus, De Bello Judaico (Wars of the Jews) 2.8.1. ^ Jewish War 1.14.4: Mark Antony "... then resolved to get him made king of the Jews ... told them that it was for their advantage in the Parthian war that Herod should be king; so they all gave their votes for it. And when the senate was separated, Antony and Caesar went out, with Herod between them; while the consul and the rest of the magistrates went before them, in order to offer sacrifices [to the Roman gods], and to lay the decree in the Capitol. Antony also made a feast for Herod on the first day of his reign." ^ "Founded in the years 22-10 or 9 B.C. by Herod the Great, close to the ruins of a small Phoenician naval station named Strato's Tower (Stratonos Pyrgos, Turns Stratonis), which flourished during the 3d to 1st c. B.C. This small harbor was situated on the N part of the site. Herod dedicated the new town and its port (limen Sebastos) to Caesar Augustus. During the Early Roman period Caesarea was the seat of the Roman procurators of the province of Judea. Vespasian, proclaimed emperor at Caesarea, raised it to the rank of Colonia Prima Flavia Augusta, and later Alexander Severus raised it to the rank of Metropolis Provinciae Syriae Palestinae." A. Negev, "CAESAREA MARITIMA Palestine, Israel" in: Richard Stillwell et al. (eds. ), The Princeton Encyclopedia of Classical Sites (1976). ^ Josephus, De Bello Judaico (Wars of the Jews) 2.6.3; Antiquities 17.11.4 (17.317). ^ Josephus, Antiquities 17.188–189, War 1.664. ^ Ben-Sasson, Haim Hillel (1976). A History of the Jewish People. Harvard University Press. p. 246. ISBN 978-0-674-39731-6. Retrieved 4 September 2013. When Archelaus was deposed from the ethnarchy in 6 CE, Judea proper, Samaria and Idumea were converted into a Roman province under the name Iudaea. ^ A History of the Jewish People, H. H. Ben-Sasson editor, 1976, page 247: "When Judea was converted into a Roman province [in 6 CE, page 246], Jerusalem ceased to be the administrative capital of the country. The Romans moved the governmental residence and military headquarters to Caesarea. The centre of government was thus removed from Jerusalem, and the administration became increasingly based on inhabitants of the Hellenistic cities (Sebaste, Caesarea and others)." ^ H. H. Ben-Sasson, A History of the Jewish Peoples, page 247–248: "Consequently, the province of Judea may be regarded as a satellite of Syria, although, in view of the measure of independence left to its governor in domestic affairs, it would be wrong to say that in the Julio-Claudian era Judea was legally part of the province of Syria." ^ H. H. Ben-Sasson, A History of the Jewish People, Harvard University Press, 1976, ISBN 0-674-39731-2, The Crisis Under Gaius Caligula, pages 254–256: "The reign of Gaius Caligula (37–41) witnessed the first open break between the Jews and the Julio-Claudian empire. Until then – if one accepts Sejanus' heyday and the trouble caused by the census after Archelaus' banishment – there was usually an atmosphere of understanding between the Jews and the empire ... These relations deteriorated seriously during Caligula's reign, and, though after his death the peace was outwardly re-established, considerable bitterness remained on both sides. ... Caligula ordered that a golden statue of himself be set up in the Temple in Jerusalem. ... Only Caligula's death, at the hands of Roman conspirators (41), prevented the outbreak of a Jewish–Roman war that might well have spread to the entire East." ^ The Mishnah (ed. Herbert Danby), Oxford University Press: Oxford 1933, s.v. Tractate Shebiit 9:2; compiled by Rabbi Judah the Prince in 189 CE. ^ See p. 1 in: Feldman, Louis (1990). "Some Observations on the Name of Palestine". Hebrew Union College Annual. 61: 1–23. JSTOR 23508170. Wikimedia Commons has media related to Judea (Assyrian + Roman).